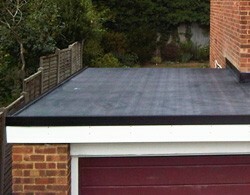 Rubber roofing offers a modern, stylish finish to your flat roof. Lasting many decades, rubber roofing will flex with your building, leaving it completely protected against the elements. It has the added bonus of its water runoff being safe being non-toxic, meaning you can collect rainwater and utilise it, reducing you water bills. To learn more about rubber roofing, just give us a ring and call us on Nottingham 0115 815 7004. We started out fitting all kinds of roofs in 2001, so we’ve got plenty of experience in the industry, and many happy customers who will tell you that we’re an excellent choice when it comes to fitting rubber roofs in Nottingham. We prioritise you and we ensure we uphold exceptional safety standards. What does rubber roofing have to offer? For rubber roofing in Nottingham, get in touch today.